The Historic American Flag series from All Star Flags features the 27 legal flags that have flown throughout America's history. Each flag is from our heavy-duty nylon material. This 13 star flag is made from our heavy-duty nylon material. This 1777 American flag has sewn stripes, appliqued stars, and is finished with a canvas header and brass grommets. 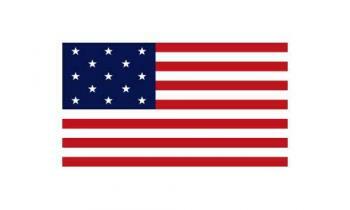 --- The 3x5' 13 Star American Flag is for states: Connecticut, Delaware, Georgia, Maryland, Massachusetts, New Hampshire, New Jersey, New York, North Carolina, Pennsylvania, Rhode Island, South Carolina and Virginia.